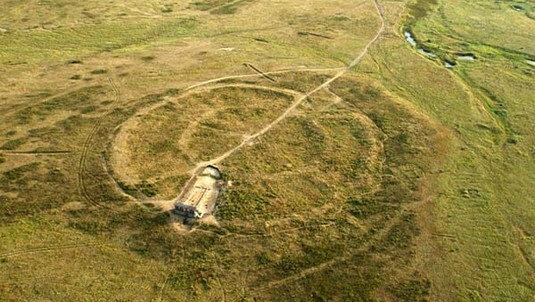 Arkaim is a Bronze Age fortress in the Ural. Although it is now a ruin, it was once an advanced fortified city, well planned with drainage and sewage systems, mines and metallurgy facilities. Artifacts found at Arkaim were dated to 4,000 BC, but the site itself is much older. It is built as a troy town or maze, like other ancient structures all over Europe. Remarkably, Arkaim is located at the same latitude as Stonehenge in England. Arkaim Circles layout resembles the Milky Way. It also functions like some sort of astronomical center: events like sunrises and solistices give special effects. It fits Plato’s description of Atlantis in several ways as well as those of other legendary cities. Arkaim has seen many more anomalies than have ever been recorded at places like Stonehenge. The place seems alive with unexplained phenomena. There are regular UFO sightings, lights and other unexplained events. It is considered a sacred place, many people come for prayer and meditation. Water and clay in the area is thought to cure diseases. On the other hand people say that there are risks. Trees have anomalous shapes and are burnt in some places. People who stay too long, risk going insane, start hearing the voices of the ancient inhabitants of Arkaim. Many nationalistic theories surround the site. Scientists are trying to prove which ancient people founded Arkaim – and they are all too often biased towards their own ethnic descent. But no theory seems convincing so far. We just had nothing to do with it, Arkaim is foreign to us. It is not in the collective memory of any civilization on Earth today. Like the pyramids in Egypt, Puma Punku etcetera. We cannot explain why it was built and cannot use it for anything. We just have to accept that a pre-diluvial civilization set up the site with advanced knowledge that we no longer have today. It could have been alien civilization. How else could Arkaim be shaped like the Milky Way? Nobody knew what that looked like until very recently. And what powerful, unknown energy source operates at the site, causing so many anomalies ? Is the site suited for meditation at all ? The energy source is something beyond us and could be dangerous. Further investigations on this are and energies around are necessary.